WordPress vs Blogger, an unofficial fight. WordPress has always been on top because it is more SEO friendly, and that is true. But that does not means that Blogger is not SEO friendly. The reason is WordPress rely on meta tags. Meta tags are used to store information about data. Previously, search engines used to rely on keywords for providing better and relative search query. But now, search engines use meta descriptions for accomplishing above task. Here, our focus will be only on the article. Putting description is not a hard job, more over it is a single time task once done. You can leave it untouched for several months. Optimum length for meta descriptions? It depends on search engines, different search engines have different limits. So, you need to put the search description anywhere, between 120 to 180 characters. Just remember to include most relative keywords and search queries within the first 120 character. In case your, meta description exceeds the maximum limit of search engine, the exceeding content is simply trimmed. Nothing to be worried about. You won't get penalized for exceeding the limits. But still it is unnecessary effort, to place a meta description of 500 - 600 character, that would be insane. There are a number of Blogger users who don't include meta data in their blog posts. And this causes lowering of organic searches. Adding meta data is easy in Blogger just add Search Description while creating blog post and you can enter or modify meta data any time. How to add search description? In blogger's editor on the right hand side, is Post settings pane that has search description option. 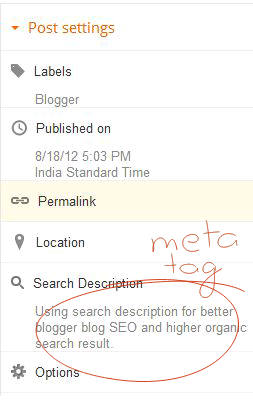 How to know that search description is a meta tag? Using search description for better blogger blog SEO and higher organic search result. Now, you need to open page source of this blog post that contains the coding of this blog post. If you are using Google Chrome or Firefox just right click inside the window anywhere on the websites'/weblog's canvas except links or images. In the menu that opens you will find View page source in Chrome/Firefox and View source in Internet Explorer, just click it and in a new tab the codes will open up and don't worry these codes cannot be edited. Now use "Ctrl+ F" to find search description entered. post, Thanks for posting this informative blog.....well done.